Savannah Guides is a non-profit network of professional tour guides and tourism operators with a collective in-depth knowledge of the tropical savannahs of northern Australia. The organisation fosters ecologically sustainable interpretive tourism. Savannah Guides’ members must demonstrate a commitment to conservation values, meet strict standards of operation and abide by professional codes of conduct to achieve accreditation. The Savannah Guides are experts in the conservation of this region and are committed to passing on this knowledge to others, along with the interpretation and effective management of the natural and cultural assets of northern Australia. 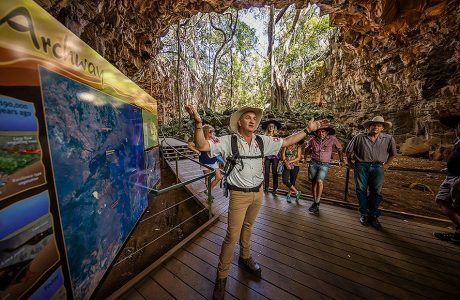 We are proud to be senior enterprise members of the award-winning Savannah Guides who ensure we provide you with the highest quality interpretive tours of the Undara region. At Undara Experience, we take tour guiding very seriously and we understand that a good guide is essential to creating your once in a lifetime travel experiences. Savannah Guides has won several tourism awards since its inception, including the 1997 Queensland Tourism Award for Industry Training in the Private Sector and was the Australian Divisional Winner and overall Global Winner in the 2000 British Airways Tourism for Tomorrow Awards. Savannah Guides won the Specialist Tourism Services category at 2007 Tropical North Queensland Tourism Awards as well as the 2007 Northern Territory Brolga Award for Tourism Education & Training. A good guide is essential to creating your once in a lifetime travel experiences. For more information on the Savannah Guides Network please go to the Savannah Guides website.